You can create a group assignment by using the Group Assignment checkbox. 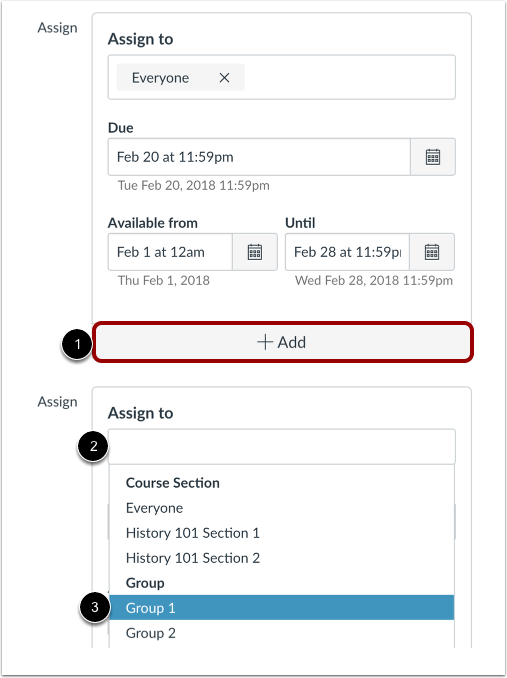 Canvas uses group sets to assign group assignments, and each group within the group set that is assigned to the assignment is required to complete the assignment. When creating or editing a group assignment, you can assign an assignment to specific groups. 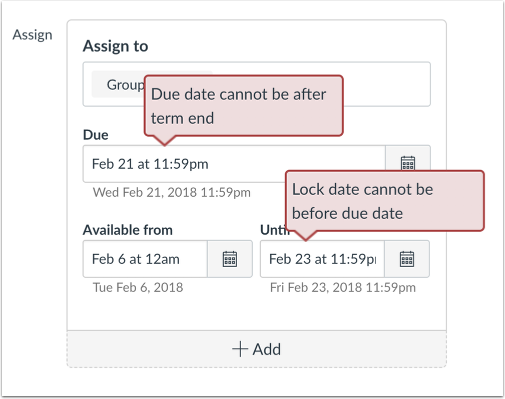 You can also set different due dates and availability dates for a group within an assignment that is assigned to the rest of the class. You will need to assign a group set as part of the assignment. 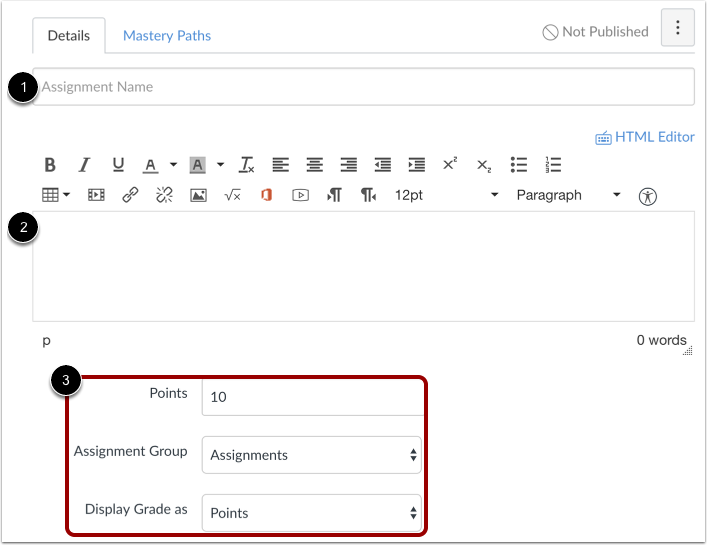 You can add an existing group set, or you can create a new group set as part of the assignment and add students to groups later. 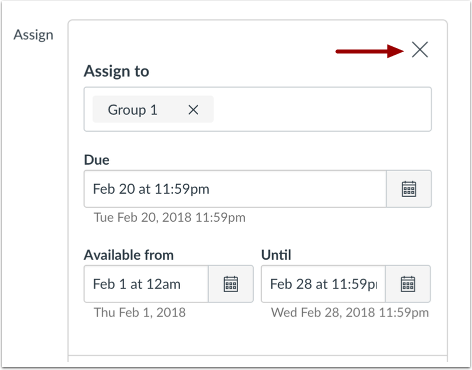 However, if you create a group set with self sign-up or manual group assignments, you will not be able to use the group set until users have been added to the subgroups. Student-created groups cannot be used for group assignments. When differentiating groups in assignments, students can only view the assignment if they are a member of an assigned group. Otherwise the assignment does not appear in the student's assignments page. Grades cannot be assigned for students who have not been included in the assignment, and assignments that are not assigned to a student are not factored into overall grades. In group assignments, one submission will count for the entire group. Learn more about evaluating group work. Group assignments cannot be used with External Tool assignments. In group assignments, all students should be assigned to groups before the assignment is published. Grades and submissions may be affected for students who were not in a group at the time of assignment submission but who were later added to a group. Click the This is a Group Assignment checkbox. You can choose to assign grades to students individually by selecting the Assign grades to each student individually checkbox. If this box is left unchecked, all the students in the group will receive the same grade. 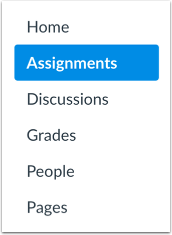 Note: Groups created by students cannot be used for Group Assignments and do not appear in the drop-down menu. Peer reviews can be used with group assignments. If you want to assign peer reviews, click the Require Peer Reviews checkbox. By default, Canvas will assign your assignment to everyone in your course. To add new due and availability dates for other users in your course, click the Add button . Then start to type the name of the group in the new Assign to field . Search fields are dynamic, and you can search by any part of the group name. Click the group's name when it appears . Lists are not scrollable. 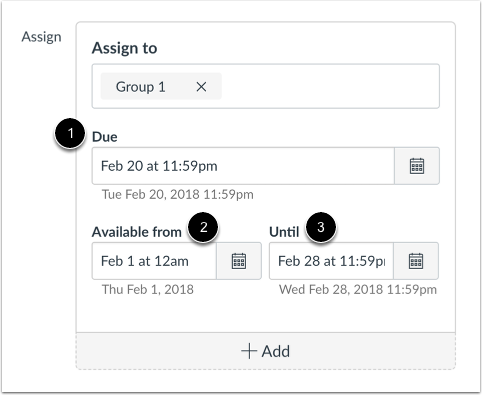 You can include more than one group in the Assign to field as long as the groups are to be assigned the same due and availability dates. 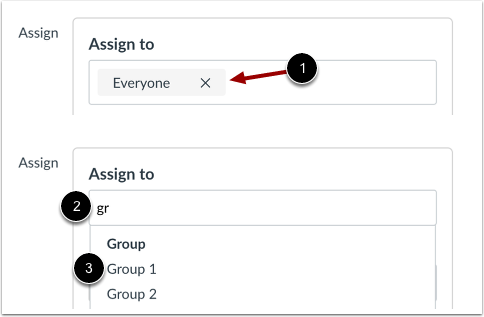 To create the assignment that is only for a specific group in the group set, click the Remove icon next to the Everyone label . Start to type the name of a group in the Assign to field . Click the group's name when it appears . Even when you aren't adding sections, you will see a warning message asking you if you want to add sections. 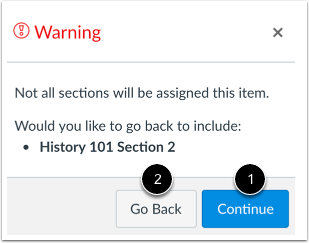 You can click the Continue button  if you don't want to add any other sections to the assignment, or click the Go Back button  to go back and add sections. Note: This warning message will not appear if everyone in the course or all course sections are assigned. Previous Topic:How do I assign an assignment to a course section? 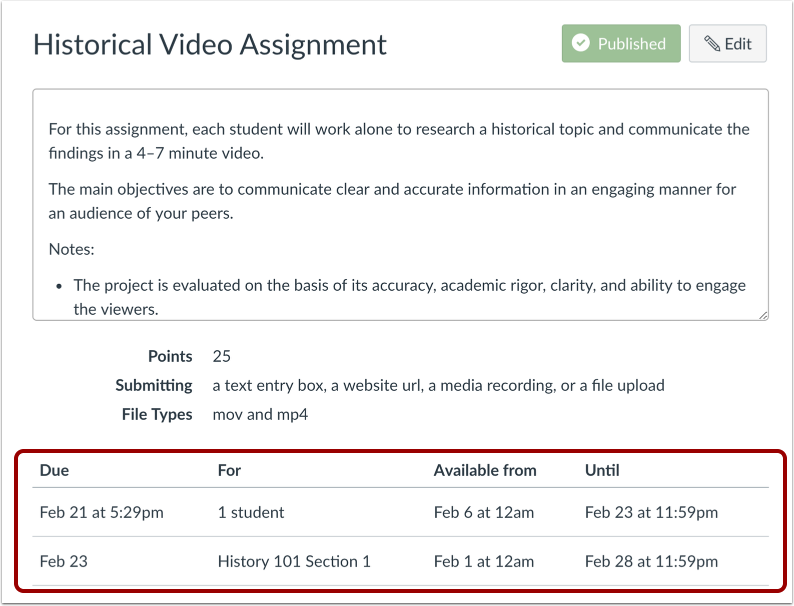 Next Topic:How do I view differentiated assignments with different due dates in a course? Table of Contents > Assignments > How do I assign an assignment to a course group? Any possibility of Group grading being possible in the future for external tool assignments? It's certainly not impossible, but as of right now I'm not aware of any specific plans to add this as a feature as far as product team priorities have been planned. Your best bet at this point is to create a feature idea in the Canvas Studio. I wasn't able to find any similar ideas in my quick search, but you may want to conduct your own search through the ideas just to make sure. Re: How do I pair students for an assignment? Re: Changing an individual's grade after a group grade has been assigned. Re: How can I group students (ie: Tuesday group and Thursday group) and use this to add different due dates for the same assignment?